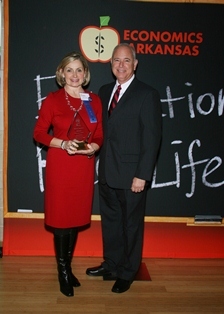 It was that time of the year again when we said “well done” to an elite group of Arkansas public school teachers. On Nov. 8, 12 educators who have demonstrated to their students that there is nothing “eeek” about economics were recognized for excellent teaching during the 17th Annual Bessie B. More Awards luncheon at the Great Hall of the Clinton Presidential Center in Little Rock. In attendance were the award-winning teachers and their families, plus many Arkansas leaders from commerce, industry, agriculture, goverment and education who applauded the honorees. The program was opened by Bob Watson, superintendent of the El Dorado School District and long-time EA board member, who welcomed the almost 200 guests and thanked the sponsors. EA Executive Director Sue Owens stepped to the podium next to introduce EA friends, educators, partners and volunteers. Owens was followed by Ray Hobbs, president and CEO of Daisy Outdoor Products and EA board member, who congratulated EA on its 50th anniversary and recognized nine lifetime board members who served on the board 25 years or longer. After lunch, we turned our attention to the teacher presentations and the awards ceremony. Two honorees had been invited to bring some of their students and discuss their projects. Shelina M. Warren from Jack Robey Junior High School/Pine Bluff School District described her project “College Tour 2012.” It was designed to decrease the high school dropout rate by providing intrinsic and extrinsic motivation to all students involved. Warren said that she expected that once her students stepped on campus, they would never forget that feeling and strive to be a college student in three years. One of her students confirmed that with these words: “When I was little, I didn’t believe I would be going to college but now I believe I am. My college mentor has helped me see the importance of my GPA and I believe I am college material.” His comments practically brought the house down! This economics project delivered impact in the classroom! Also presenting was Lynn Massey from Harp & Lee Elementary Schools/Springdale School District. Her project, “Masseychussetts: A Model City on the Economic Horizon,” instructed students to set up and operate businesses such as the Massey-Mart. They learned about commercial loans, investment risks, marketing, customer service, credit, profits and loss and community involvement. The final highlight of the luncheon was the keynote address. Arkansas Commissioner of Education Tom Kimbrell introduced the speaker, Ray Simon, the former deputy secretary for the U.S. Department of Education. Simon stressed the importance of economic and personal finance literacy. He contrasted the “cookie jar” banking of the past with today’s overuse of credit cards. Generations who lived in the early 20th century saved up for purchases by putting pennies and dollars in a cookie jar; if the jar was empty, the purchase was delayed, he said. In contrast, today’s consumers tend to buy and buy until the credit card is maxed out and then apply for another one, a behavior that can have dire financial consequences, Simon added. Teachers are in a unique position to teach financial literacy as the “cookie jar of the 21st century,” he pointed out. If teachers were securities, they would be considered high-investment grade bonds or growth stocks with high value because they are able to develop financially literate students while supporting effective teaching while stimulating economic growth, Simon said. Read feedback from guests here. 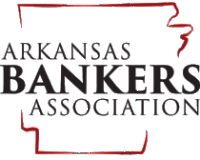 Economics Arkansas launched the Bessie B. Moore Awards program in 1995 to honor exemplary teachers for successfully integrating economic principles into the classroom. The contest is open to educators K-12 from public and independent schools in Arkansas. To enter, teachers submit written descriptions of their projects, which are reviewed and judged by an independent panel of economic education specialists. The winners receive cash awards and plaques. Up to 12 awards are presented each year, six in a Newcomers division and another six in the Veterans category. The deadline to enter is typically in early to mid-July, with an awards luncheon in early November. The 2012 Awards luncheon was made possible, in part, through the generous support of these organizations. Thank you.